The Last Leaf Gardener: Oh, kitchen armoire, oh kitchen armoire, how lovely is your surface . . .
Oh, kitchen armoire, oh kitchen armoire, how lovely is your surface . . . The image posted above is a photograph (taken in my kitchen) that shows some details of the 'winter-time garden' that I keep inside during the winter season. This "garden" is comprised of my less hardy outdoor plants that I bring into my apartment (from my roof-top extension urban garden which I go to great lengths to winterize. 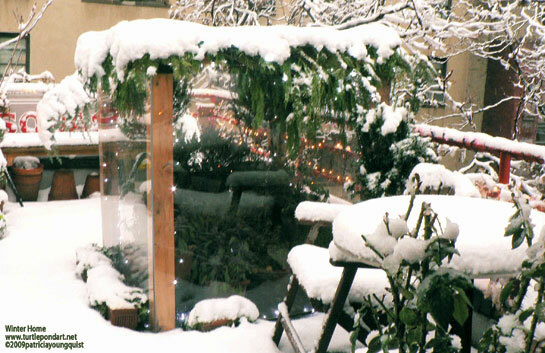 I have also created a line of greeting cards based on some of my past roof-top extension garden winterizing endeavors. These cards are quite special to use for sending holiday wishes. They are part of my petite wrap-around card collection. As for the plants that I bring inside, I place them on top of humidity trays (placed below a cold/warm light system that is connected to a timer then suspended) that are filled with pebbles. This method is a great way to preserve the humidity and to keep the plants happy during the winter months. I also find this a nice way to decorate for the holidays, when, in a relatively small New York studio apartment such as mine, there is no room for a Christmas tree; no matter how "lovely its branches" —besides, maintaining a little garden inside keeps my green-thumb muscles supple during the long winter. 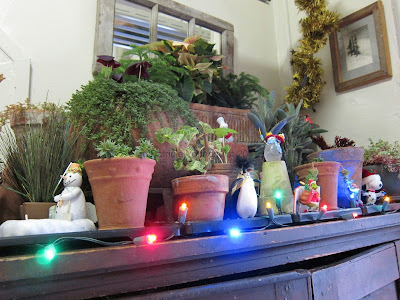 As you can see, my inside garden is located on top of a piece of furniture, which anyone can easily do (in this case it is a wooden canning cabinet that has been in my family for over one hundred years and moved with great care up seventy steps to get to my apartment), and it is decorated with Christmas ornaments as well as lights —how lovely is my armoire's surface! ". . .tis the season . . . "